This stunning double CD brings together outstanding songs from cutting edge worship leaders and contemporary Christian artists. Includes contributions from Andy Hunter, Jason Upton, Third Day, Charlie Hall and stacks more. 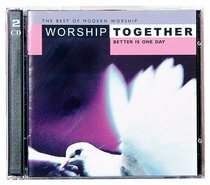 About "Worship Together #05: Better is One Day (2 Cds)"